Ronda and I arrived in Cebu excited for a relaxing island stay mixed with Filipino excitement. With 3 nights at an amazing Air BNB and an eyeful of adventure, it was sure to be a great stay. The Philippines are a perfect place for backpackers on a budget or flashpackers like ourselves ready to spend a little more. If you’re heading to Cebu you’re sure to enjoy these top favorites from our stay!Book now to get the best deals on amazing villas like the Blue Orchid! This was the highlight of my stay and the big ticket item that drew me to Cebu in the first place. For a paltry 2500 pesos ($50) they’ll pick you up at your hotel and head to Oslob near the southern tip of Cebu. (It’s a 1.5 hour ride from Moalboal and a hair longer from Cebu City) Whale Sharks are a protected species as the world’s largest fish. They skim the surface for zooplankton and are always available for tourism since local fisherman feed them from 9am-12pm. Get the best selling Philippines guide for FREE with Kindle Unlimited and $20 without it! Snorkeling with these monsters can be intimidating for some but once you’re in the water you forget about all that as they swim past you. Symbiotic smaller fish tag along creating a diverse assortment of life. Careful near the top; I got a few jellyfish stings but nothing bad enough to spoil this magical experience. 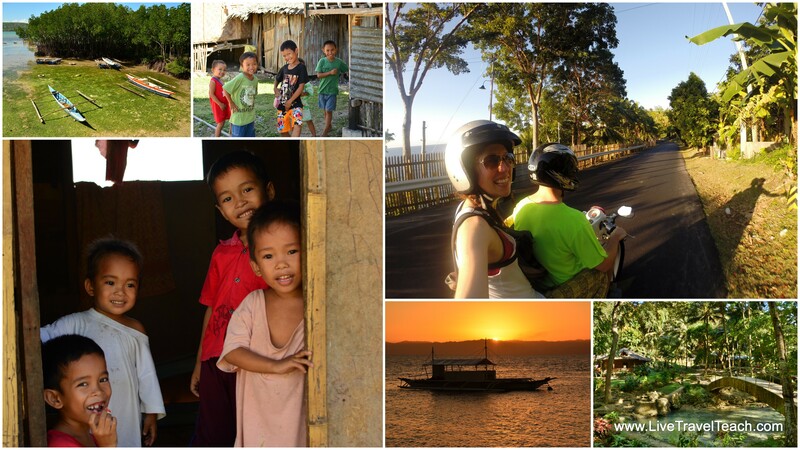 In Moalboal you can easily find a motorbike rental for about 500 pesos/day. Make sure to check the breaks and don’t forget your helmet! One of the biggest mistakes tourists makes when motorbiking keeping their sandals on. If you’re good on a bike it probably won’t matter but if you’re new then be sure to wear real shoes in case you have to bail. Photos by Ronda Christensen & Mike Still. Just under 20 km south of Moalboal you’ll find Kawasan Falls. There’s a giant sign on the left where a local will try and convince you to park the bike for 50 pesos and then guide you to the waterfall for another 150. It’s unclear if you really need to pay these fees since a few hundred meters later you’ll see the actual entrance for another nominal park entrance fee. Following the crystal clear river you pass through a tiny village and might find some massive insects and spiders hiding among the leaves. Don’t let these critters scare you away because the massive waterfall is just around the corner. At Kawasan falls you can have a snack at the restaurant, swim in the beautiful water, or pay to ride a bamboo raft beneath the wall of water. They also run canyoning adventures here but we decided to pass in lieu of some more time on the motorbikes. This English – Tagalog Pocket Dictionary for under $4 for Kindle! 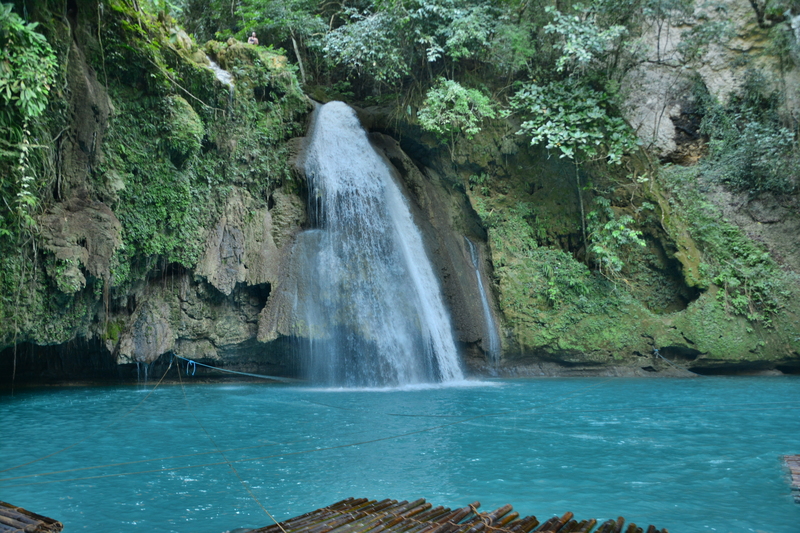 Tumalog Falls are just outside of Oslob and the perfect pairing with a whale shark tour. Most tours take you to both places and I would highly recommend booking one that includes Tumalog. 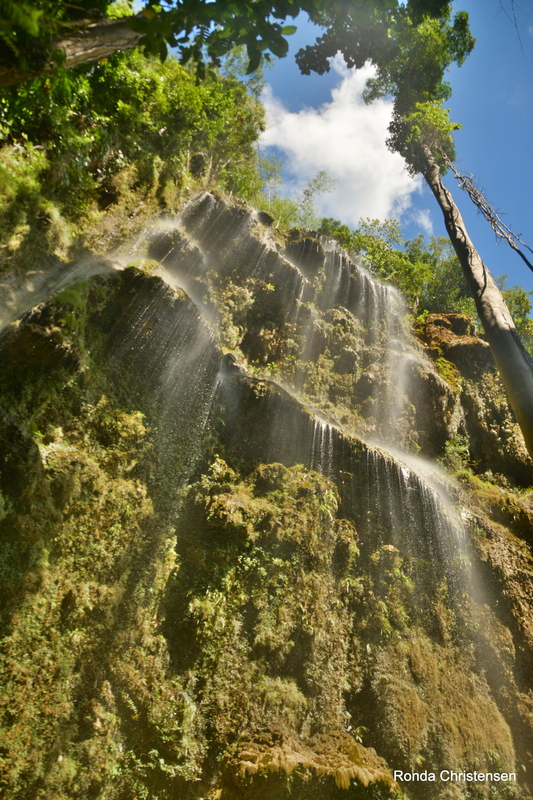 This massive fall towers above the jungle as a beautiful spray dances slowly down to the bathing pool below. It is a steep walk from the parking lot to this landmark but for 50 pesos each way you can jump on the back of a motorbike. The best time to go to Cebu is right now! Okay well, maybe not because the Philippines is in the monsoon season from June to October and can get typhoons in September or October. Weather is hard to predict and you can easily enjoy a rainy trip to the Philippines but I’d advise booking a trip from Nov – May if you want to go to Cebu at the best time of year. Looking for other great spots in the Philippines? Check out the 15 best islands in the Philippines here! Moalboal is a gem tucked away on Cebu’s western coast. This tiny little town is the perfect stop for those wanting to go to Oslob, visit a beach some waterfalls and get away from the bustle of Cebu City. Stay overnight in one of the backpacker hostels, grab a hotel or book an Air BNB like we did. 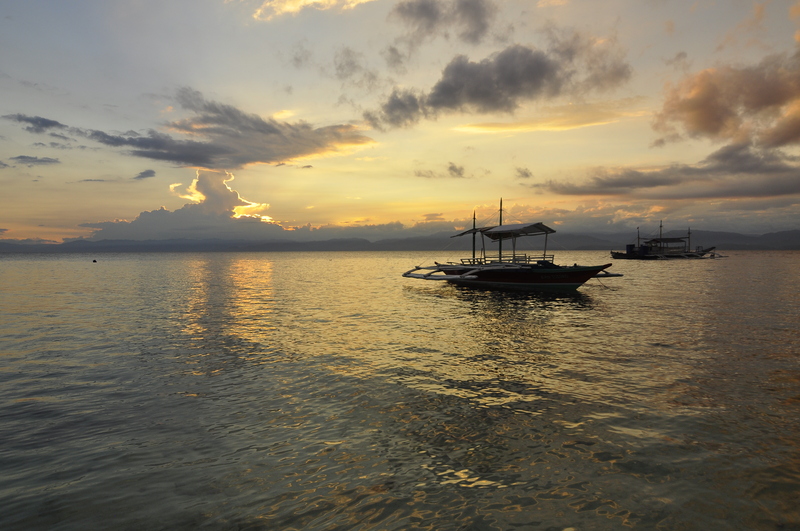 In Moalboal you can easily rent a motorbike, book a tour or jump or a dive boat. White beach is just around the corner and this village has the best restaurants in the area. Before you head to the beach be sure to pick up a GoBreezie towel! Their patented sand free design makes sand slip or shake off even when its wet. Its very versatile, absorbent and quick dry plus when you combine the signature bag with its lightweight, compact design it becomes the perfect travel towel. Use it at the beach, the pool, for yoga or as a wonderful gift for that special someone! Namaste is my favorite design and they have free worldwide shipping and it arrives in 2 days within the USA so it won’t be a problem to get it before you head to the Philippines. Moalboal’s white beach is pristine with a westerly view. 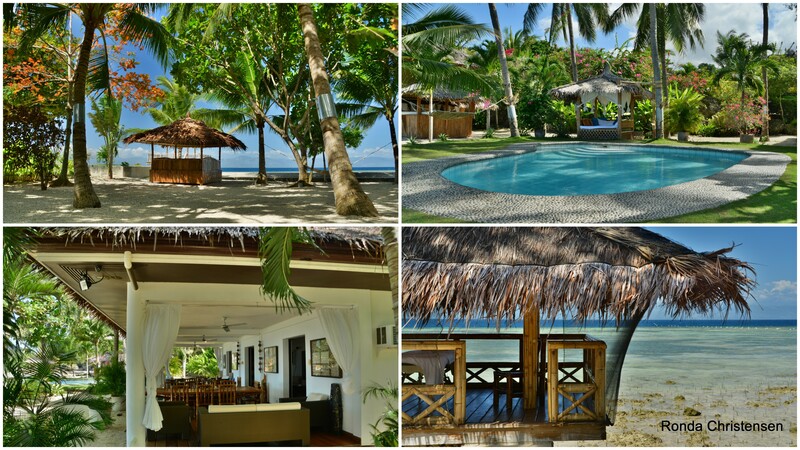 It’s the best beach on Cebu and perfect for all of your beach activities. 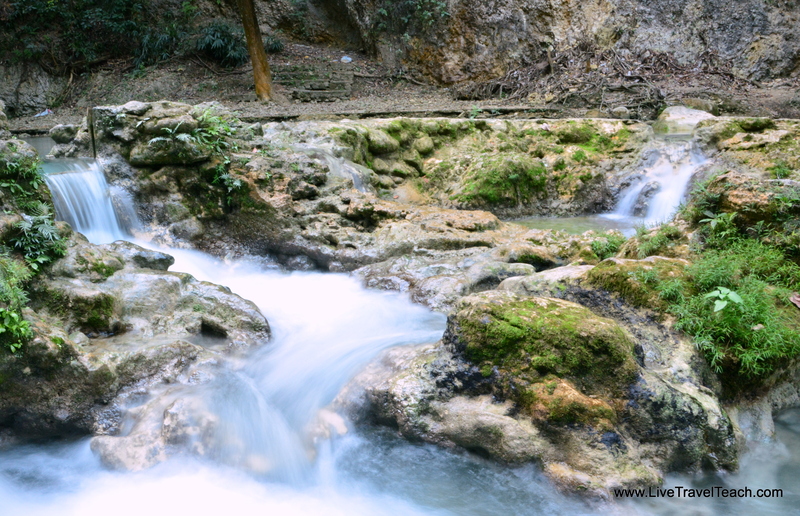 Unfortunately we didn’t have time to try Canyoning in Cebu but we hear it’s an amazing way to explore the jungle. Tours bring you to a river, gear you up and give you a chance to hike the waterway and descend through a series of waterfalls. Definitely on my list if I return to Cebu! Are you in the Philippines? Check out this amazing Street Food Guide! Would I go back to Cebu? Hell yeah! But honestly, I might pick a different island for a return trip to the Philippines. Cebu is a gorgeous island in an archipelago of paradisical wonderlands but it just doesn’t hold its own when compared to Boracay or Palawan’s beaches. The great thing about Cebu is the variety of adventurous activities available and if you’re like me and drawn by the whale sharks then be sure to explore these other great excursions. Have you been to Cebu? Tell us what you liked in the comments! It does look you had a great adventure on one island! The whale feeding in Oslob has been part of a recent controversy since the whales are artificially fed so that they would stay there instead of roaming around. Was that the case when you were there? It still is a little artificial but the government only lets them do it in the mornings and they are surprisingly strict about it. Definitely would be cooler to see them in the wild but in Oslob you’re guaranteed to see them. Headed there this weekend to go canyoning and am so excited. I’ve been to Cebu a bunch, but never to Moalboal. That Air BnB looks awesome. Awesome pictures bro! Amazing place. Added to the Philippines list, Cebu is. Good advice on the motorbike too. After riding one for a fair amount of time during the past 5 years – i.e., for 2 years during trips to Bali and Thailand – ya gotta keep shoes or sneakers on your puppies if you bail. Even when you’re a vet, wear flip flops sparingly. Ripped up my foot something nasty when I hit the pavement twice during accidents. My podiatrist best buddy would be shaking his head LOL. Thanks for sharing! Ryan, ouch man. Foot road rash is the worst! I’ve seen some pretty bad cases but thankfully always on other people. You’ll love Cebu! If you’re there for longer check out Bohol too. I had to skip it but am tempted to go back! We visit Cebu often but never knew about the whale feeding in Oslob, this has to go on the to do list! Glad I could help show you a new adventure! Safe travels CJ! Every beach in the Philippines seems to be even more beautiful than the last. The waterfalls also look really incredible. I’d love to visit Cebu. There are too many beautiful beaches to count in the Philippines. For even more amazing beaches check out El Nido! Great ideas for a perfect weekend! If had to choose, my top picks would be the falls. I’d love to swim there and take a few photos. Cebu makes for a great weekend or even a full week! That is a good variety of things to do. I am not sure about the sharks though. 🙂 Thrilling indeed! They were so thrilling but they are harmless I promise! OMG every aspect of the place looks amazing. Not sure how courageous I am to jump in with the whale shark, but I think traveling via scooter or tbike on islands/beach side towns is always the best way. The kawasan falls looks gorgeous. The scooter was one of the best parts! You can just go to any beach or waterfall that you want. 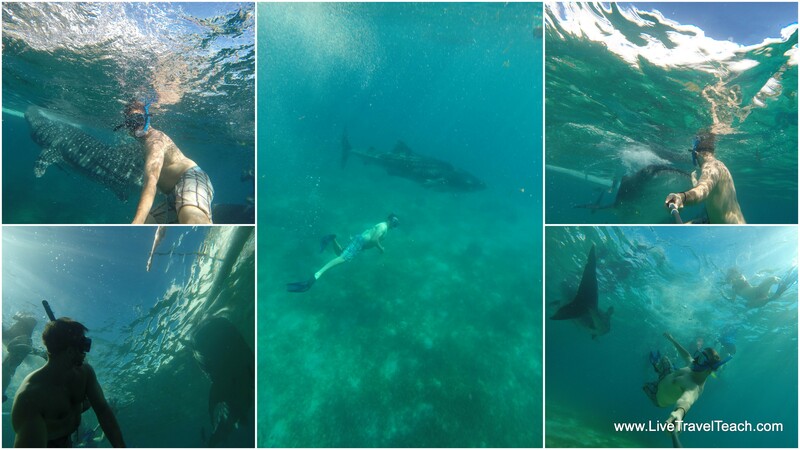 Love the pictures and swimming with the whale sharks does sound like an amazing experience! I’ve been to Cebu once and honestly found it quite touristy, but if I do go back again, I’ll make sure to try what you’ve recommended! I’m going to The Philippines in two weeks for the first time! We have been trying to decide on where to go so this is super helpful 🙂 Thanks! Just amazing!!! I´ve never been in Philippine but i see that this is a wonderful country… Great suggestion of a place to visit. Its such a beautiful country. You’ll love it if you visit. I have been aching to visit this part of the world! That beach and falls are a huge reason why, but swimming with the whale sharks would be icing on the cake! Spectacular shots, cannot wait to see it all for myself! I hope you make it to Cebu soon. Its such a fun island! I was just introduced to Cebu on a collab post on my blog. Sounds like a lovely place with lots of adventures to be had. Thanks for sharing more about it, and the town of Moalboal. 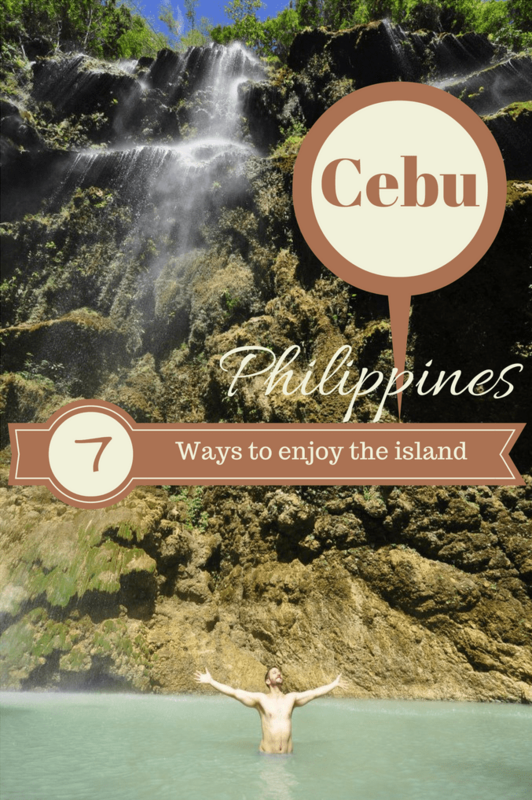 Cebu is still under the radar but a great island in the Philippines! I absolutely loved Palawan too. Frankly I liked it a little better than Cebu but they offer different experiences. Cebu is more adventurous and Palawan more relaxing I think. You can read about my trip to Palawan here! Hi Mike! I’m from the Philippines and it always makes me a proud Filipino when people enjoy my country. 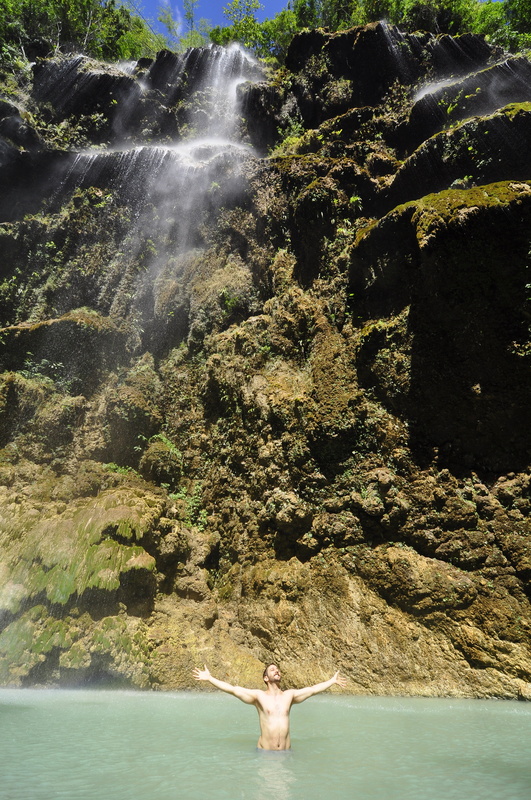 Cebu, indeed, has a lot to offer from beaches to waterfalls and canyoning. To be honest, though, I am not keen on the way the whale shark tourism is handled in Oslob. Artificial feeding and some swimmers directly touching the sharks have long term effects on the natural behavior of these wild animals. I think this weblink (if I may attach a link) best explains the negative impacts of this practice in Oslob – http://dive-bohol.com/conservation/5-reasons-not-go-oslob/. In my opinion, whale watching in Donsol, Sorsogon in the northeastern part of the Philippines is a better option as they do not allow artificial feeding that’s why there’s only a certain season for spotting them, and the guidelines on watching/ swimming at a certain distance from the sharks is more strictly implemented. Oslob is a great destination but I do hope that regulations geared towards sustainability get enforced. I have just added Donsol to my list! I understand the issues with the whale shark tourism and it can certainly have damaging effects. I think a lot of those issues have been addressed with new laws but they are certainly still an issue. I know that they are only allowed to do the tours for a few hours in the mornings so that the sharks have to hunt for their own food for the rest of the day and while I was there they didn’t allow anyone near them. Definitely not touching them. Also they don’t let you put on sunscreen if you are swimming with them. A girl in my group wasn’t allowed to go in because they saw her putting sunscreen on! They made her wait a long time (I think an hour or 2) so that the sunscreen wouldn’t come off and get into the water. I’m sure there are people who disregard the laws but there are a lot of groups that adhere to them too. Everything sounds amazing except for the whale shark part. LOL I’m bit of a scared-y cat, but I eventually give in and do it anyway. So maybe I would give it a try. Thanks for all these great tips. I can’t wait to get to that part of the world!! I can’t wait for you to get there and blog all about it! OMG! Those waterfalls are gorgeous! I’ve always wanted to swim with whale sharks! It was such a fun experience swimming with the whale sharks. I hope you get to do it one day! The Philippines is really high on my to go to list. Posts like these are the reason why. The waterfalls looks awesome.